In a fully automated production process a depalletiser is indispensable. A fork-lift truck loads a pallet with stacks of crates on a transport conveyor, after which the depalletiser will automatically separate the stacks from the pallet. Our depalletisers are suitable for Euro- and Pool pallets and will recognize the different pallet configurations which can occur on a pallet. 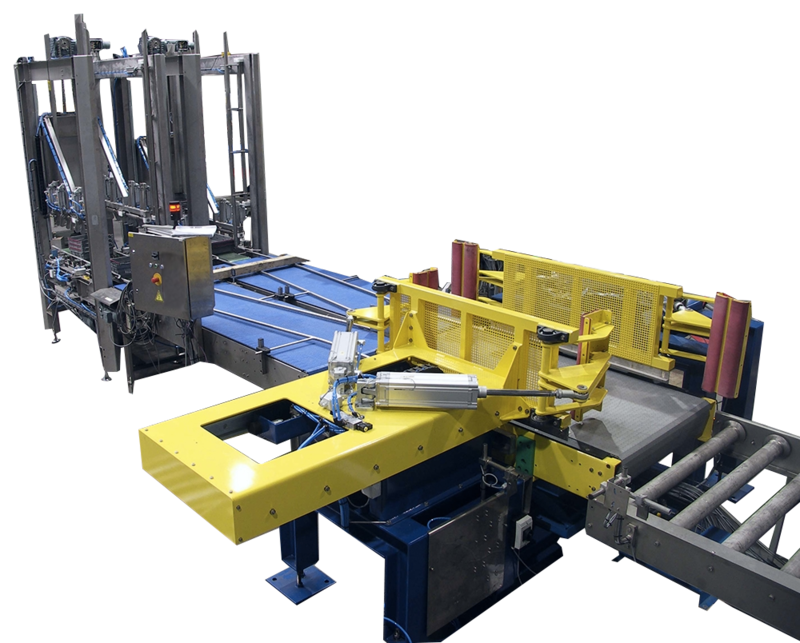 In a fully automated production process a palletiser is also indispensable. In addition to the depalletiser at the entry of the system, a palletiser at the exit of an automated system may be provided. After the crates are stacked by the stacker, they will be transported to the palletiser. Depending on the type of pallet which needs to be palletized, the stacks of crates will automatically be rotated in the correct orientation, in order to get the correct configuration on the pallet. Once a pallet is fully palletised, it will be transported away by a conveyor and the pallets with stacks of crates can be taken away by the fork-lift truck. Do you want to talk about the Depalletiser/ Palletiser? You want more information about Depalletiser/ Palletiser?